Consistently rated among the world’s best international airlines, Air New Zealand was named ‘Airline of the Year’ by Air Transport World in 2010 and 2012. It was also named ‘Airline of the Year’ in AirlineRatings.com annual Airline Excellence Awards for four consecutive years from 2014 to 2017. Air New Zealand’s success is grounded by a focus on true product innovation and a commitment to delivering a world-class flight experience to every customer. Air New Zealand has been connecting travelers for 75 years, operating, on average, 500 flights a day within a network of 51 cities in 17 countries including 22 destinations within New Zealand. North American services include non-stop flights to New Zealand from San Francisco, Los Angeles, Houston, Honolulu and Vancouver B.C., and Los Angeles non-stop to the Cook Islands and London. As a member of the Star Alliance network, Air New Zealand provides access to almost any destination in the world and their trans-Tasman alliance with Virgin Australia offers convenient connections to and from New Zealand to 34 domestic Australia ports. 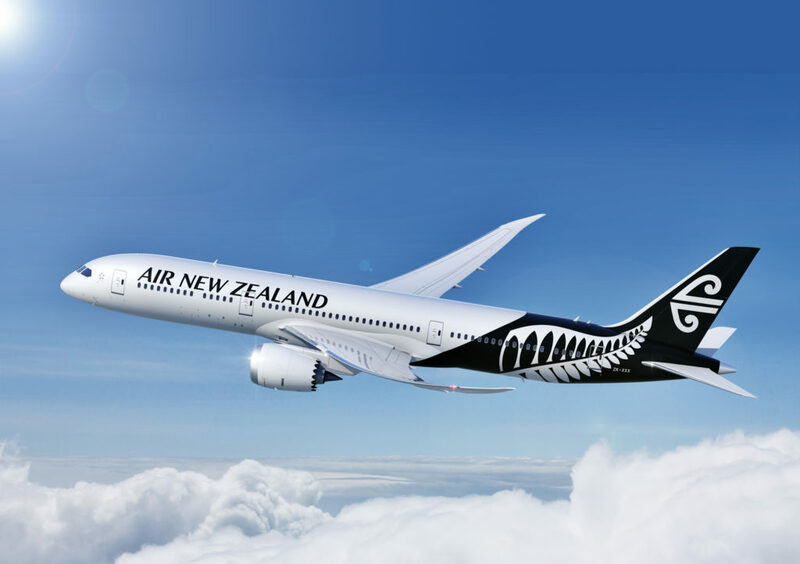 Air New Zealand customers enjoy reciprocal loyalty rewards, services and greater connectivity through the Alliance’s global network of airline partners. Business Premier is the equivalent to first class. Every luxurious 22” wide leather seat has direct aisle access and converts into a completely lie-flat bed 6’8” long – one of the longest in the sky! Enjoy exceptional meal and beverage service with an extensive selection of premium New Zealand wines to complement the meals. You are allowed 3 free checked bags per person and you have access to the international lounges in your gateway cities. US add-ons are in first class where available. Premium Economy is like the old business class. Sit back in plush leather seats with generous armrests, a leg rest and extendable foot support.Enjoy more legroom with 41” seat pitch – the largest in its class – and relax with 50% more recline than Economy. Seat configuration is 2-4-2. You also receive premium check-in, on-board amenity kits, upgraded meal/beverage service, premium headphones and personalized in-flight service. You are allowed 2 free checked bags per person. You do not have lounge access included. US add-ons are in economy class. Economy is standard coach class, with seating configuration 3-4-3 on most aircrafts. You have the same on-demand entertainment as the other two classes, and dinner and breakfast are both served during the flight along with numerous snacks. You are allowed 1 free checked bag per person and you do not have lounge access included. Economy Skycouch™ is like having your very own couch on the plane. It is a trio of Economy seats that together create a 5’1” couch – perfect for families traveling with young kids to use as a play or sleep area.